It does work – but it’s not slick or fast. If you want a cheap JTAG adapter for remote debugging or big flash writes, get an FTDI-2232 based one. But, it’ll be fine for fiddling with bootloaders or just interrogating hardware. We agree that the Bus Pirate is good for JTAG and flash tinkering, but once you get a taste you’ll want something built specifically for bandwidth-intensive tasks. We’re working on our own FTDI-2232 JTAG programmer, the Bus Blaster. You can read more about it, and contribute to development, in the forum. Bus Pirates are shipping now for $30, including worldwide shipping. 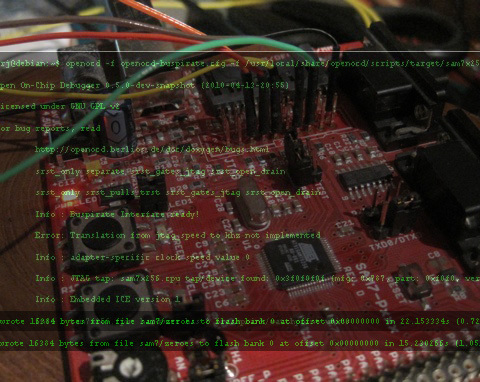 This entry was posted on Thursday, April 15th, 2010 at 11:00 pm	and is filed under Bus Pirate, FPGA, JTAG. You can follow any responses to this entry through the RSS 2.0 feed. You can skip to the end and leave a response. Pinging is currently not allowed. It would also be worth while to take look at Microchip MCP2200 chip. Simpler than the FTDI solution.